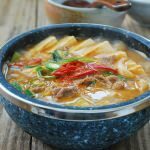 It’s been over 5 years since I last posted a doenjang jjigae (된장찌개) recipe, which is a staple stew made with fermented soybean paste, doenjang. It was a very basic doenjang jjigae recipe, that I made with fatty pork, but a very popular one. Head over there if you like meat in your stew. This time, I made a variation made with seafood. 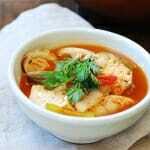 Any type of seafood can be added. 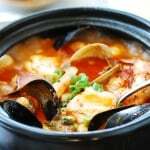 The typical additions are clams, mussels, shrimp, squid, and oysters. You can use any one of these or a combination. The most important ingredient in doenjang jjigae is obviously doenjang. 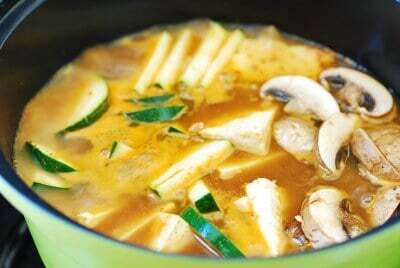 Doenjang is traditionally homemade, but most households buy commercially available doenjang these days. For many years, we were lucky enough to have doenjang that my mother-in-law made. It was the best doenjang! Now that she’s unable to make it, I usually resort to locally made home-style doenjang that’s sold at some Korean markets. If unavailable, I get one of the major brands. 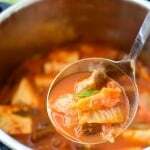 We all know by now a good Korean stew requires anchovy broth, and it doesn’t take much time to make it. 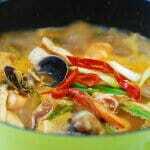 Make a habit of using anchovy broth in your stew. Dry anchovies last a long time in the freezer. 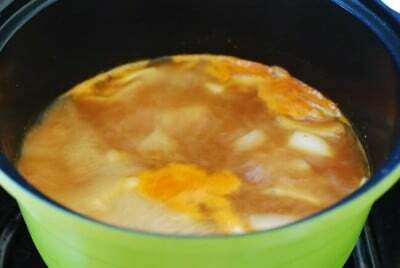 A small trick you can use for doenjang jjigae is to use a small amount of vinegar at the end. 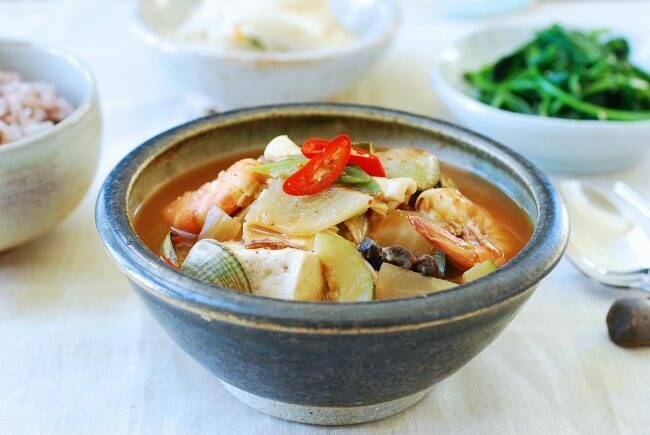 It will brighten the doenjang taste, making the stew even more delicious! Rinse and scrub the clams. 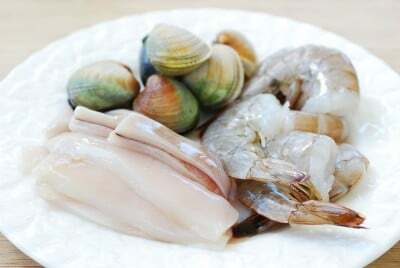 Place the clams in salted water (1 tablespoon of salt in 2 to 3 cups of water) for 30 minutes or longer to get the clams to spit out the sand. Clean the squid, and cut into bite size pieces. Clean the shrimp. Cut the tofu into 1/2-inch thick bite size slices. Cut the zucchini, onion, mushrooms, and radish into bite size pieces. Roughly chop the scallion. Add the anchovy broth (or water) and soybean paste to a small pot. Stir well to dissolve the soy bean paste. Add the radish and onion. Bring it to a boil over medium high heat, and cook for 3 to 4 minutes. 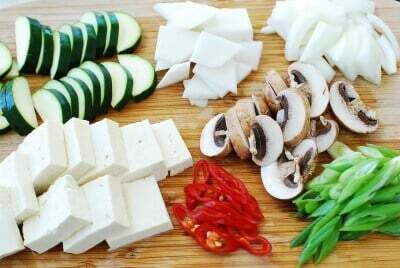 Add the tofu, zucchini, mushroom, and chili pepper. Boil for an additional 2 minutes. Add the seafood, starting with the clams. Cook for another 2 to 3 minutes or until the clams are open. Stir in the vinegar, and throw in the scallion. Cook for another minute or two. 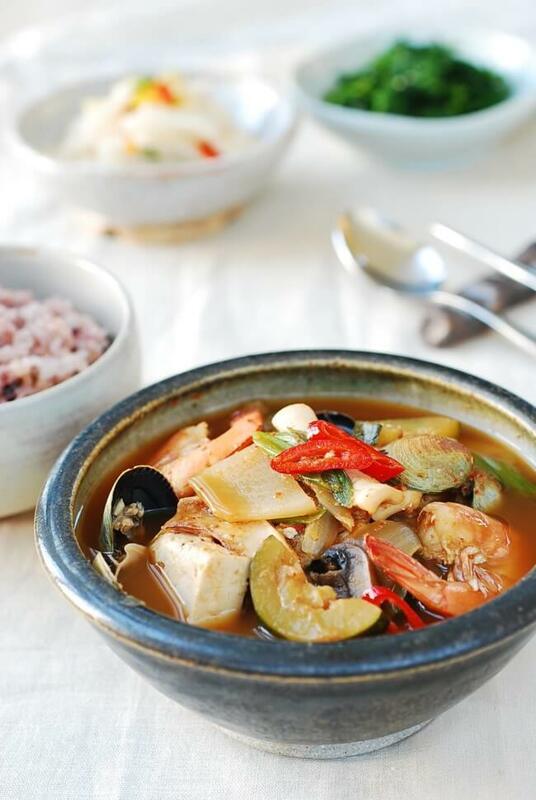 Use the water used to rinse rice, ssal ddeum mul or anchovy broth for jjigae/stew. For anchovy broth, boil about 10 medium dry anchovies and one 3-inch square dried kelp in 4 cups of water for 10 minutes. 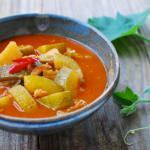 This looks like a wonderful recipe and great tips. I am definitely trying anchovy broth aswell. Thank you for sharing. 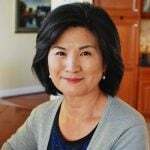 Thank you, Sally! Hope you try it soon. 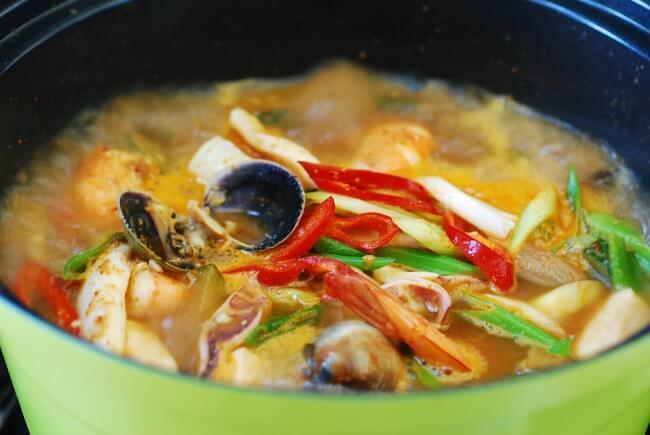 is the splash of vinegar special for seafood doenjang jjihae or can you use it with other types of meat in doenjang jjigae? 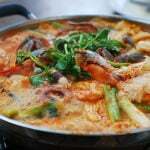 You can use it in any doenjang jjigae. How do I preserve the leftovers? Hello Angela – It should be fine in the fridge for 3 to 4 days. Thanks so much for sharing your recipes! 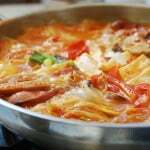 I am so attracted your recipe of adding vinegar to jjigae. What kind of vinegar do you suggest? Any clear vinegar, such as white vinegar and rice vinegar, will do. Enjoy! Awesome! Hope you like it. I see red pepper flakes listed. When do we put it in? But it’s not in the instructions. When does it go in? Sorry to repeat myself in the first question. It also seems the garlic is missing in the instructions as well. Hi! You’re suppose to sauté the garlic and pepper flakes with the ssamjang paste and then add it to the anchovy water. what’s the reason for putting the vinegar at the end? thank you. 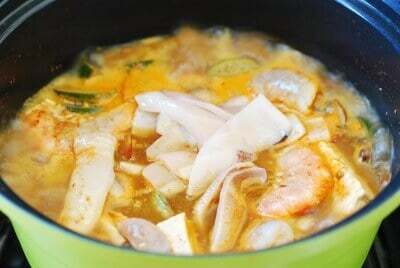 It will brighten the doenjang taste, making the stew even more delicious!